As much as I am happy and excited about Mutant Winter III, there is another winter cycling solution I am interested in. 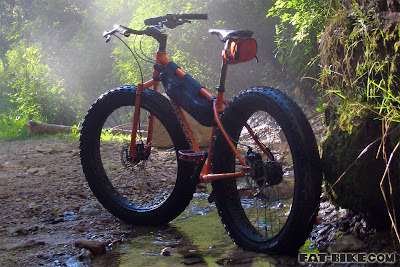 Fat Bikes. These are bikes that are designed for use on snow or sand or generally ugly terrain, characterized by crazy wide rims and very wide and usually rather soft tires. Good examples of the most popular are the Salsa Mukluk and the Surly Pugsley. The reason I'm interested is that I could ride the unplowed and icy MUPs in London Ontario on one of these wonderful mutant-by-design bicycles. Studded skinny or even MTB tires aren't good enough to handle them; I have tried. The thing is, crazy wide rims and tires require crazy wide forks and crazy everything else. Crazy is expensive, especially when 1 in 1000 cyclists* will really want and actually pay for one. To give you an idea, searching ebay.ca for "surly pugsley" or "salsa mukluk" doesn't even yield any results featuring full bikes... $300 rims, etc, but no bikes. I don't have the money to buy one of these things. A Pugsley sells for about $1700 on REI. A Mukluk runs about the same. I started looking into building one, but quickly realized that even the parts and tires put these things out of reach for me right now. One nice thing I discovered while looking into building one of these monsters was gripstuds.com. There have always been DIY methods of studding bike tires, but I've never really believed that hardware store screws would hold up very well. Grip Studs fill the gap nicely. They are expensive, but with these you could stud any tire you wanted with high quality studs rather than trying to find a finished product like I have so far. I think I'm gonna go talk to the people at First Cycleworks... they seem to enjoy building mutant cycles more than most other shops in town and I'm hoping they might have some useful and doable fat bike advice for me. Wish me luck! * That statistic is based on nothing tangible. The 1000 could as easily be 500 or 10000. The author of this blog is thinking you'll get the idea whether number is accurate or not. Fat bikes are intriguing but, as you say, not cheap. The practical cyclist has to ask whether the amount of use justifies the investment. If you don't need the flotation of the enormous tires you don't really need the wild and crazy bike. For icy surfaces you can get a variety of more normal-sized studded tires at fairly approachable price points. A rider who uses a Pugsley around here says the super-wide tires still slither on ice. The large contact patch doesn't enhance traction without metal claws. I have not tried a fat bike on snow. This spring I used a regular mountain bike on the slushy remnants where snow machines had used the path at the pitiful height of our pathetic winter. Even with 2-point-something tires the bike wallowed quite a bit. I just don't know whether the winter will dish up enough snow to make a fat bike truly worthwhile. I, too, lust after fat bikes, but don't know if I'll be able to afford one any time soon. The best I can hope for is something like a Salsa/Troll/Ogre for off-road touring. For now, I'll stick with my $40 CL MTB special. Cool, haven't seen a fat bike in London yet. You may be the first :). I just use trials rims on a normal mtb frame with standard tires at 20 psi or so. Cafiend - I agree the wide tires would still slip on ice, that's where the addition of those gripstuds comes in. I also agree I have to think realistically about how often I would NEED such a thing. The trouble is this ugly dimpled ice surface you can find frequently on the paths. The dimples bounce even studded tires around. I'm dreaming of a tire so wide it soaks up the dimples and uses studs to grip the ice. Sadly, I know that this special condition doesn't warrant the investment for me. Which is why I'm hoping against hope that I'll find a way of making a poor man's Fat Bike! adventure! - Yes, lust is the right word. I need to control my bike vices if I can. jakub - Same here, my winter bikes so far have been wider rimmed MTBs, with studs and low PSI. You could always try the Fat-front style: Install a fatbike fork on a normal frame, and run the big wheel/tire there. It should help with control issues on the dimpled surface, I would think. I built up a Mukluk, last winter. By building it, I spent about $20 less than I would have if I had bought a whole bike, but my spec is a little better than Salsa's. I use my Mukluk as a mountain bike, in the summer. Sandy washes and ridgy rock sections that have people on regular bikes walking don't even phase this thing. I don't ride on so much ice and slush as you do. Heck, I wouldn't even know how to ride in >= 3" of snow. However, given my hope is to get the heck out of TX someday, to some place cooler, so I find the information in this post not just enjoyable to read, but quite informative. Talking about ice and snow, I wish I hadn't gotten rid of my ole fridge.